LOVED this! I read it in one day, could not put it down for anything. Engaging right from the start, this dystopia about criminalizing unsavory morals and ethics was just what I needed for my first day of our fall break. SUMMARY: Seventeen-year old Celestine North sees the world in black and white. Situations are either right or wrong. Ethical or unethical. Celestine and her family are Perfect, unlike the scores of Flawed citizens living among them. Flawed people made bad choices, and they were branded with the F because of it. But when Celestine acts on instinct to help someone who needs it, she finds herself arrested for being Flawed. REVIEW: This book was fabulous! Loads of action, interesting characters, and a swoon-worthy love interest. I will have no problem booktalking this with my students and plan to purchase the book with my next order. I especially see my scores of The Selection readers diving into this one. The love triangle is similar, too. Art and Aspen could be the same person, and they have a similar character arc. I love how Celestine starts out so naive and trusting, but her character changes slowly over the course of two novels. I read the second book, Perfect the day after finishing Flawed, and I loved it also. 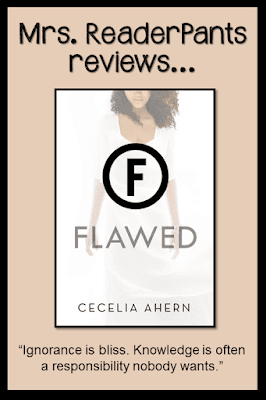 Flawed and Perfect are a duology; I do not expect to see a third novel. I really like duologies; they are long enough to develop the story and characters and short enough to avoid unnecessarily stringing things out. I don't really have so much to say about Flawed other than that I really liked it. No complaints from me. THE BOTTOM LINE: An easy-sell with students who love dystopia-romance titles like Matched or The Selection.